Living in a home that truly depicts your dream is one of your biggest desires and this can be made possible if you plan wisely from designing to construction. It is essential for the homeowners to know their requirements before they could move forward to the layout plain and front elevation design procedure. In fact, a home that not only stands out amongst the rest but also blends with its surroundings and neighborhood, is what you need to be looking for. 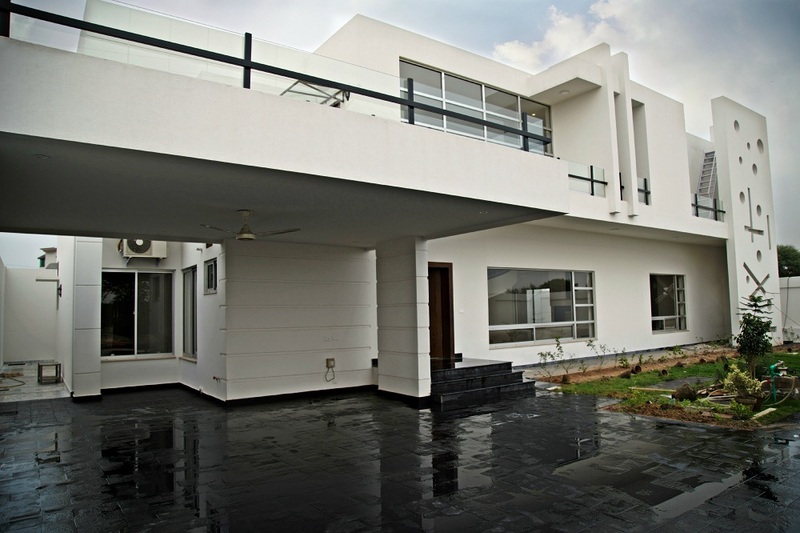 The modern house construction designs in Lahore portray contemporary design features that make use of symmetrical geometric shapes. It is quite a complicated job to design the exterior of such a home as choosing the right colors, materials, balancing the lines, shapes and a lot more is not an easy task. According to ExteriorPortfolio, the line, shape & balance, texture, space and color are the primary elements that need to be considered while designing the exterior and interior of a home. So if you want to make people stop in their tracks and gawk in awe of your home’s beauty, you must acquaint yourself with the following exterior design essentials from AmerAdnan®. The rule of thumb when designing a home’s exterior is to maintain a balance between the symmetry and the shapes. Doing so will make your home’s facade look pleasing to everyone. In order to achieve a proportional home exterior design, an architect/designer makes use of many different ways that include some obvious symmetry while others are not too apparent. It gets really difficult to decide the types of materials that would make a winning combination with your home exterior. There are plenty of options for homeowners today such as aluminum, wood, vinyl siding, brick, stucco, shingles and a lot more. The best idea here is to maintain a perfect balance of aesthetics with the durability. For a country guy or girl, the best choice is cedar shingles and tumbled stone. On the other hand, for a modern minimalist, the simple wood panels or the lines of sleek steel are great choice. The color combinations play primary role in enhancing the façade of a home. Deciding the type of color that would best suit your home depends on the shape of building. A paint job, when done artfully and skillfully helps hiding the flaws of a building, however, when it is done poorly, it may end up drawing attention to the design flaws instead. According to Sherwin Williams, the best way to choose colors is to pick two tints of the same color strip and a few shades apart. Making a contrast of the two shades of the same color strip for body and the trim respectively would add to the elegance of your home. Moreover, a third contrasting accent color is also used for punctuating the door. Apart from the three primary essentials one should also keep the secondary essentials in view, which includes selection of right garage doors, windows, roof, entryway and lighting. Also, don’t forget the landscaping as it is what further elevates your home exterior design job.